[First published on January 23, 2006] In Part I, I presented the empirical democratic peace propositions that in their totality imply the democracy is a method of nonviolence. These propositions, however, concerned violence. However, proponents of nonviolence might say: nonviolence is not just the avoidance of violence, it also involves willingness to negotiate and compromise, and to tolerate differences. It is an attitude of peacefulness. Can you say this about democratic leaders? Yes, and indeed, democratic institutions encourage a democratic culture encouraging these nonviolent behaviors. And we now have empirical evidence of this in a book, The Democratic Peace and Territorial Conflict in the Twentieth Century, by Paul K. Huth and Todd L. Allee. They focus on the process of international disputes to their ending in settlement or war. I am impressed with the author’s methodological skills in using multinomial probit and bivariate logit analysis, and attention to detail and assumptions. Therefore, I think their empirical findings are solid. They analyzed all 348 territorial disputes involving 1,528 rounds of talks between nations 1919-1995, each of which is described in the appendices. Territorial disputes are the kind most likely to lead to war. They also analyze 6,542 observations on whether parties to the dispute adopted a status quo stance, sought negotiations, or threatened force. In 374 cases, they led to military confrontations, which in 89 cases escalated to the brink of war or, in 40 cases to war. Now, as to their results, they further verify the propositions on violence I presented in Part I. Out of the 348 cases, only 16 between democracies involved nonviolent military confrontations (troop movements, military alerts, reinforcing the border, threats), but “there are no cases of mutual decisions to escalate to a higher levels!” (p.251) E.g., to violence or war. Then, they find that democracies are most likely to initiate talks over a dispute, and to offer concessions. Such, however, or tied into the election cycle in a democracy. After an election, talks and concessions are most likely. This generally supports an explanation of democratic peacefulness in terms of democratic institutions, rather than nonviolent norms among leaders. Also, democratic leaders are more likely then nondemocratic leaders to favor negotiations over threats of force. They are more likely to seek accommodations, even in disputes with nondemocracies. The common idea that democracies are only peaceful with each other, and are as aggressive toward nondemocracies as nondemocracies are toward each other is inconsistent with the evidence. Absence of war between democracies is due largely to their reliance on negotiations. Its jaw, jaw, rather than fight, fight. In disputes between democracies and nondemocracies, when a dispute escalated to the military threat level, it was usually due to the more aggressive policies of the non-democracies. Among nondemocracies, those whose leaders had particularly violent norms were more likely to initiate violent threats rather than negotiations. The use of deterrent strategies by democracies is more effective in preventing escalation than those of nondemocracies. The greater political accountability of democracies enhances the credibility of their deterrence strategies. Also, because of the accountability of democratic leaders, their concessions and agreements in a dispute are more likely to be believed. “Stoppa krig och folkmord med ett Demokratiernas förbund” Mathias Sundan has put on his blog the Swedish version of my paper I published here yesterday. 2006 Index of Economic Freedom. 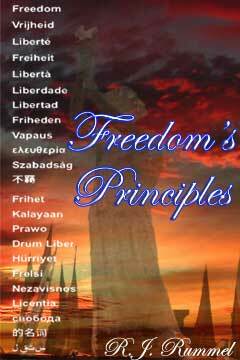 The book is downloadable free. On the ratings, Hong Kong and Singapore are number 1 and 2, the U.S. is 9th, below Labor Party governed Britain, former communist Estonia, Catholic Ireland, and Denmark, which is sometimes labeled democratic-socialist. New Freedom House Website In setting up their new website, freedom house did not include transfer link coding for all old links to their site. So, except to their home page, all my links on previous blogs to their data and reports are invalidated. Best I not comment. Just in case you missed this. Here is former Clinton aide Nancy Soderberg, author of “HYPERLINK “http://www.wiley.com/WileyCDA/WileyTitle/productCd-0471656836.html”The Superpower Myth: The Use and Misuse of American Might” (foreword by Bill Clinton, blurb by Madeleine Albright) in an interview by Jon Stewart actually hoping for an American defeat in Iraq, and failure in negotiations with Iran and N. Korea. “Analyzing The Brookings Numbers [on Iraq] from December” Shows that there is a downward trend in civilian deaths, in terrorist/insurrectionist attacks, but a slight rise in IED deaths. 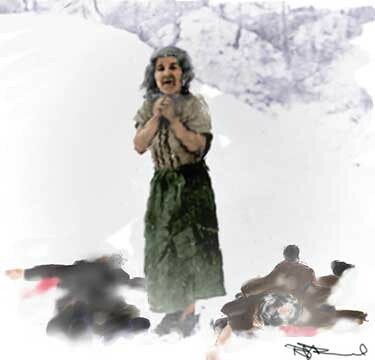 [First published on January 23, 2006] On the right is my water color/oil painting based on a photo of an old woman waiting in the snow to be killed by the Nazis. This one hit me particularly hard, and I used art as a way of expressing my feeling. Given recent comments on my posts, I either have not been clear about why democracy is a method of nonviolence, or new visitors are unaware of what I have posted before. First, I suggest that new visitors who have questions about what I have posted take advantage of my topically organized archive. There is also in the right sidebar of this blog the capability to search the content of all my blogs on this site. Democracies do not make war on each other and never have. Democracies almost never commit any form of violence short of war against other democracies. Of all nations, democracies fight the least severe wars by orders of magnitude. Democracies have the least internal violence of all nations. Democracies do not murder their own people, and when engaged in war, commit the least democide of all nations. Therefore, democratization is a method for ending war and democide, and minimizing foreign and domestic violence short of war. Now, isn’t it fair to say that democracy is a method of nonviolence? Over the year plus that I have been doing this blog, I have dealt with many of the claimed exceptions to the above, such as democratic Finland in WWII, the Civil War, Hitler’s Germany, the Boar War, the War of 1812, the Spanish-American War, and so on; with the popular belief among academics that democracies are as warlike as nondemocracies; and with the supposed empirical findings that nations in the process of democratization are more warlike than other nations. None of theses claims hold up on inspection. A particular source of misinformation and misconceptualization is Matthew White’s website: “Democracies Do Not Make War on One Another….or Do They?”. I have written a blog on his assertions, which I answer in detail by citing the empirical literature, and by collecting new data, which all show that White is systematically wrong: democracies do not make war on each other. In Part II [also just posted], I will provide the latest and most comprehensive evidence on this from the book, The Democratic Peace and Territorial Conflict in the Twentieth Century by Paul K. Huth and Todd L. Alee. We’d all like it to be, but the war’s not over. And occasionally, it still erupts in violence. No, not the war in Iraq. The Cold War between western freedom and communist tyranny. The current hysteria over the president’s authorization of some domestic intercepts by the National Security Agency reminds me of similar reaction by liberals to the Cold War. Instead of recognizing communism as a clear and present danger to freedom and liberty here and abroad, many liberals decided the real threat to those values came from anti-communism itself. RJR: This is an incredibly important mid-term election, and if you think I’m exaggerating, just think of the democrats in control of all the committees in Congress and the budget. Suspected Taliban insurgents dragged a high school teacher from his house . . . and beheaded him . . . . the insurgents had occasionally put up posters demanding that schools for girls be closed and threatening to kill teachers. . . .
RJR: What we are fighting in the War on Terror.